There is something special about the women of the Irula tribe. While most coastal women are engaged in selling fish or allied activity, women of the Irula tribe are the only ones who fish. They don’t need boats or nets. All they require is a basket to collect the prawns they catch in the backwaters. In Chennai, Irula women can be seen swooping down on prawns in the backwaters near Ennore Port. Usha has been catching prawns in backwaters since childhood. She learned the tricks of the trade while accompanying her mother when she was a child. While some women find it easier to collect prawns with the basket atop their heads, 45-year-old Usha prefers holding it in her mouth. She said her speed in catching prawns increased after marriage because she had to come home to look after her five children. Her day begins at 4 am. After finishing housework and cooking lunch, she leaves the house by 6 am to catch prawns. The next three hours are spent in standing knee deep in the backwaters and deftly catching prawns and dropping them in the basket. She sells her catch till 11.30 am and then returns home to finish the rest of the household chores. If she has any unsold fish, she returns to the local market in the afternoon after 3 pm to try to sell the remaining prawns. It is a hard life but Usha has no complaints. Before the tsunami, life was even more difficult. Like the rest of her marginalized tribal community, she too lived in temporary shelters which had no basic amenities. But after they came in touch with ActionAid and other civil society networks following the tsunami, their lives changed for the better. It is the first time that she has a proper roof over her head. More importantly, the ownership is in her name. “It is difficult to explain what then house means to me. It has given me an identity. It has provided me security. 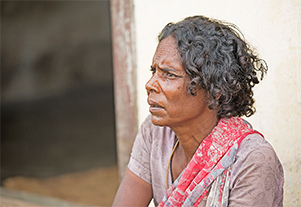 I am safe here and no one can make me leave my house anymore,” says Usha. Nomadic by nature, the Irulas reside mainly in the Thiruvallur district of Tamil Nadu and were also affected by the tsunami. They lost their shelter, cattle and documents enabling them to access their benefits as scheduled tribes. When ActionAid India stepped in with other civil society networks, their first priority was to visibilize the community overlooked by the government and ensure their voices were heard. In Athipattu village, ActionAid India helped to train women and the youth of tsunami affected community. Later, the Forum for Securing Lives and Livelihood Rights for Coastal Communities (FLLRC) encouraged the Irula women to form self-help groups and motivated the tribe to educate their children. The literacy rate of the Irulas is about four per cent. The women found an able ally in Usha. Having never got the opportunity to go to school, she was keen all the children, including her own, living in Athipattu village be educated. As a member of the child monitoring committee formed by FLLRC, she and other members have ensured there are no drop outs. “Initially parents were not keen in sending their children to school. But I was able to convince them to change their minds. All of us want our children to have better lives. If our daughters are educated, they will not have to catch prawns for a living like us,” says Usha.